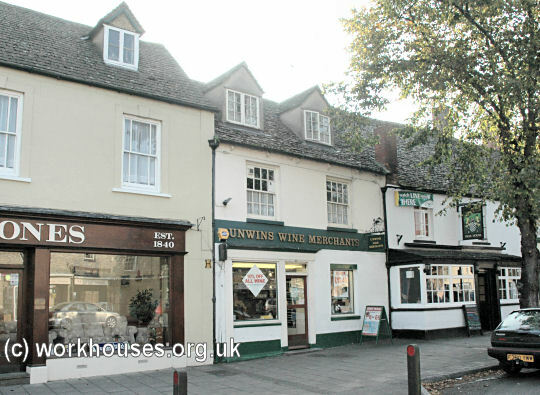 In 1730, the Witney overseers rented part of a house on the east side of the High Street, probably number 33, for use as a workhouse. They were to provide a new well and pump, and had access to the river for the washing of clothes which were dried on hedges in an adjoining close. In 1744, three cottages on the site of 45 Corn Street were rebuilt as a workhouse which then operated until 1836. In 1747, Edward Bolton, a Witney baker, was appointed by the parish overseers and churchwardens to provide "meat and drink, washing lodging and apparel for the poor". He was paid £230 for a three year contract. In 1777, the workhouse could hold 60 inmates. Parish registers record the appointment in 1789 of Edward Druce as workhouse manager (also referred to as governor or keeper) at a salary of £30 per annum paid from the poor rate. The Vestry (the governing body of the parish) also employed a permanent clerk, and retained the services of a surgeon and solicitor. In the early 1800s, the local weaving industry was suffering a decline and demands on the poor rate escalated from £820 in 1794-5 to a peak of £3197 in 1820. The administrative duties increased to the point that a paid perpetual overseer, Joseph Lardner, was appointed at a salary of £40 per annum. To try and keep the cost of poor relief in check, increasing use was made of the workhouse. The workhouse operator would contract to maintain and clothe the parish's poor in return for an annual fee, and for whatever profit he could get from the paupers' work. 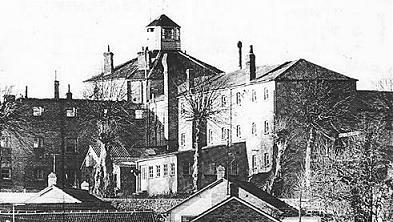 In 1807, Witney together with Curbridge, Hailey and Cogges were involved in an apparently short-lived scheme to form a union under Gilbert's 1782 Act, and the workhouse was enlarged. The union was administered by a committee of twelve rate-payers representing the member parishes which called itself the "Guardians of the Poor." In 1810, the workhouse was being run by Daniel Hartshorn at a cost to the parish of £1480 per annum. A parliamentary report of 1777 listed parish workhouses in several parishes in the Witney area including Alvescot (for up to 8 inmates), Bampton (30), Black Bourton (30), Burford (30), Hailey (40), Handborough (20), North Leigh (35), Northmoor (20), and Standlake (14). Another survey in 1817 included additional establishments at Eynsham (16) and South Leigh (6). 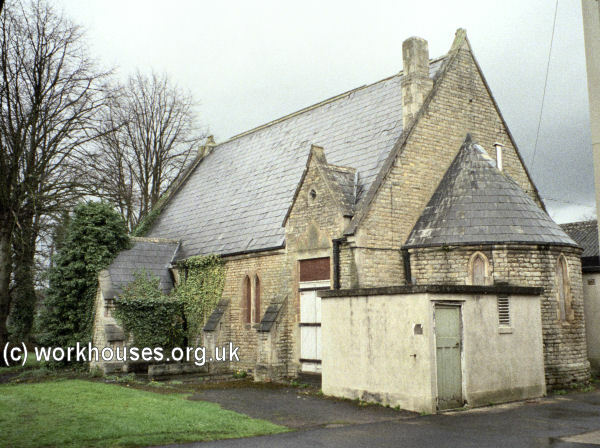 Cogges established a parish workhouse in 1788 in rented premises. For the first two years the poor were farmed by a contractor, John Rusher, who performed similar undertakings at Woodstock and in his own town of Eynsham. A succession of other contractors ran the workhouse, although in 1796-9, and in 1802-4, the workhouse was managed directly by the parish overseers. In 1801, there were 16 inmates in the workhouse, costing the parish 5s. a week. The inmates performed spinning and weaving of wool and flax both in the workhouse and at "Mr Turner's". The workhouse also appears to have had a garden — the Overseers' accounts during this period record payments for seeds and plants. The workhouse seems to have fallen out of use after 1813. The Hanborough parish workhouse may have been a building on the east side of Burleigh Green which was owned by the parish in 1761. In 1803, there were 23 inmates whose labour earned £13. 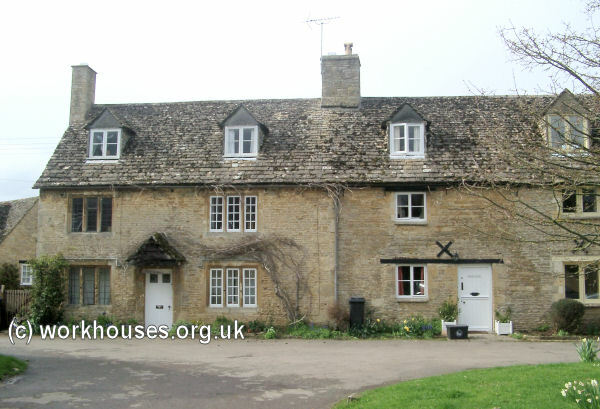 The poor were also housed in around six houses in Long Hanborough and one in Church Hanborough. In North Leigh, the poor were farmed by a contractor in a workhouse from 1768. In 1776, Thomas Brooks, a local cordwainer took on the contract for £120 a year. In 1800, when the parish overseers were managing the workhouse, the inmates numbered 24, including 3 children, although there were only 12 beds. There were eight spinning wheels and the inmates performed carding and spinning for the factories in Witney. In 1803, the inmates' work generated an income of £20. The workhouse seems to have fallen out of use after 1815. It is said that the Mason's Arms public house in North Leigh was the home of the North Leigh parish workhouse. South Leigh had a small workhouse on Green Lane which in 1803 housed 10 inmates. It appears to have fallen out of use by 1831. Stanton Harcourt had short-lived workhouse which in 1803 accommodated eight persons. Filkins had a workhouse in the eighteenth century on Cross Tree Lane. 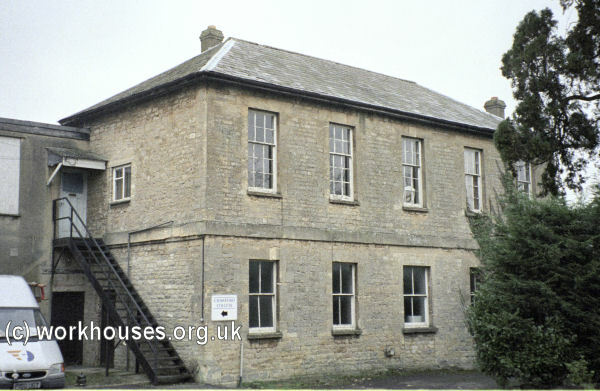 The new workhouse was built 1835-6 at a site on Razor Hill (later Tower Hill) in Witney. It was designed by George Wilkinson who was born in the town, the son of a local carpenter and builder. The workhouse was Wilkinson's first professional assignment. The Witney Board of Guardians had originally invited Sampson Kempthorne, designer of the Poor Law Commissioners' model workhouse plans, to submit as design. However, Kempthorne upset the Witney Guardians several times, most notably in proposing a brick-built design for the town which was built almost entirely in local Cotswold stone. Wilkinson was given the architectural contract but failed to secure the building contract for his family firm. Wilkinson went on to design several other workhouses in the area including Woodstock, Northleach, Stow-on-the-Wold, and Chipping Norton which has a similar layout to Witney. In January 1839, Wilkinson moved to Dublin to take on the job of designing all the new buildings for the recently established Irish workhouse system. Wilkinson favoured the plain Elizabethan style, long familiar to him from his home territory of Witney and Oxford. As a result, Ireland's 160 or so workhouses, many of which survive, would not look out of place if transplanted to an Oxford college! 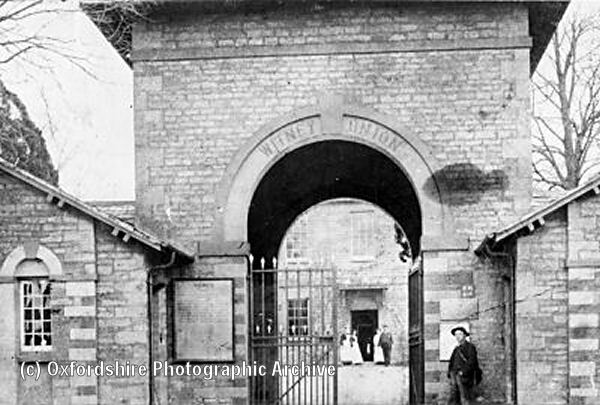 The Witney workhouse was designed to accommodate 450 people and cost around £7,500. Wilkinson's design employed an unusual "St Andrew's Cross" layout which can be seen on the 1875 map below. Witney aerial view from the north-west. The main building had a central octagonal hub containing kitchens on the ground floor, above which lay the Master's quarters whose windows provided views in all directions. Four three-storey wings radiated from the centre containing dormitories and day rooms for each of the different classes of inmate (male/female, infirm/able-bodied etc.) A small single-storey wing, running leftwards in the picture, contained the workhouse dining-hall. At the right-hand side of the main building is the administrative block. An arched entrance building, just visible, faced onto Tower Hill. The entrance at the centre of the administrative block was later closed off and turned into a window as can be seen on the modern picture below. Up until 1861, the workhouse dining-hall also served as a chapel. A separate chapel was then erected to designs by William Wilkinson — George's brother. Elderly inmates at Witney appear to have been given a surprising degree of freedom. In 1884, Jackson's Oxford Journal recorded what happened to one of them who had visited the local fair. 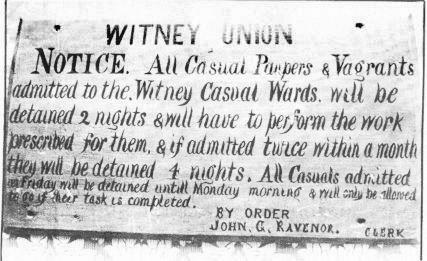 Like most workhouses, Witney had to deal with a steady stream of passing vagrants or "trampers". What they were to expect was clearly spelt out in this sign. 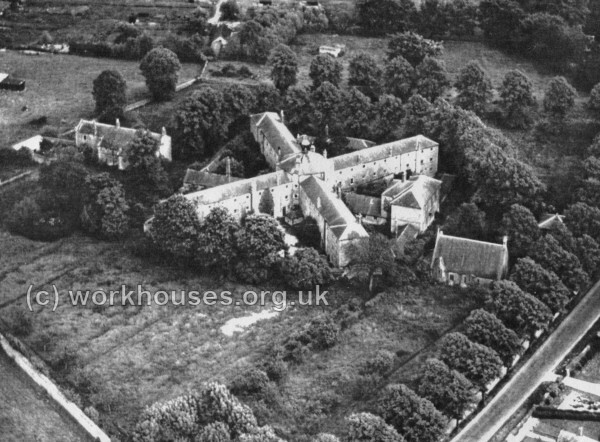 Like a number of other such establishments, Witney workhouse was used to house prisoners of war during the First World War. It appears never to have re-opened after the war. In 1940, the engineering firm of Crawford Collets moved in. The company turned over the chapel for use as the works canteen. The majority of the workhouse building was demolished in 1979 and replaced by modern buildings. Redevelopment of the site for housing began in 2004, with the chapel and entrance block being preserved. Oxfordshire History Centre, St Luke's Church, Temple Road, Cowley, Oxford OX4 2EX. Holdings include: Guardians' minutes (1835-1891, with gaps); Assessment committee minutes (1862-98); etc. Gott C & Gott J (1986) The Book of Witney , Barracuda Books. Victoria County History of Oxford , 1954, OUP.